Christine Kelly; Alice Lyons; Sean O’Reilly and all the staff at Leitrim Sculpture Centre, Manorhamilton; Hedda & Phoebe at McKenna’s Artist’s Residence & Guesthouse, Manorhamilton; Siobhan O’Malley and all the staff at the Dock, Carrick-on-Shannon; Anna MacLeod; Cliodhna Shaffrey; and Katie Lowry and Audrey Keane at the Arts Council of Ireland. 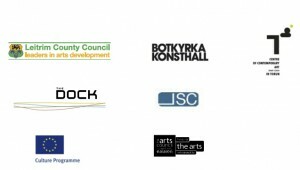 Anna Jönsson; Anne Pfennig; Ayhan Aydin; Elizabeth Hatz; Gigantprint; Katarina Bonnevier; Norrköpings Konstmuseum; the Polish Institute in Stockholm; Ylva Frid; Zöhre Alici; and all the staff at Botkyrka konsthall. Aleksandra Cygan and Pizza Hut; Bydgoszcz, Romuald Drzewiecki; Marta Kołacz and Stowarzyszenie Bydgoskie Przedmieście; Cezary Lisowski; Młodzieżowa Spółdzielnia Mieszkaniowa, Toruń; Adam Olender and Urbitor, LLC; Agnieszka Szatkowska and Areszt Śledczy, Toruń; Szkolne Muzeum Motoryzacji, Zespół Szkół Samochodowych, Toruń; Agnieszka Weseli (Furja). The European Commission support for this project does not constitute endorsement of the contents which reflects the views only of the authors, and the Commission cannot be held responsible for any use which may be made of the information contained therein.